How prone we are to overlook little things! But it is these ‘little’ things that often work destruction in our lives. The Bible teems with many such examples. “At the time when kings go forth to battle,” David took a little comfortable rest in his bedroom. That little rest ended up in abominable adultery and the heinous murder of his own faithful soldier. It was a little covetousness for just 30 pieces of silver, that made Judas Iscariot the betrayer of our Lord. Beware of the love of money. Gehazi’s little greed made him a leper all the days of his life. How many spiritual giants have been slain by ‘little’ sins! It was not a big horn, but “a little horn” that cast down “some of the host and of the stars to the ground and stamped upon them” (Dan 7:8; 8:9,10). Are we not prone to neglect to nip in the bud things that look small and harmless? This is one of the wiles of the devil to destroy and desecrate our saintly life. Peter had not planned to deny the Lord. But in that cold night, having found a bonfire near him, he had only wanted to warm himself there. That little warmth of sitting in the seat of the scornful made his life bitter and he cried bitterly. Peter’s denial has gone down in history as a warning for everyone. It is better to die in cold rather than have a little warmth at the expense of denying the Lord. The Lord wants us to be very careful about very little things – be it our very little time, money or any other thing that is at our disposal. 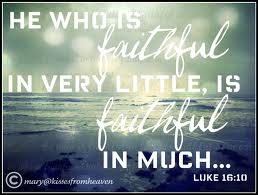 Unless we are faithful in very little, we can never be faithful in very much. It was reported sometime ago that an eight million dollar rocket was destroyed just because a hyphen (-) was misplaced in the computer programme. Once, an aircraft crashed, killing all the passengers and the crew, all because the mechanic forgot to place a nut in a bolt. He thought he would do it after a cup of tea; but afterwards forgot all about it. Obviously, it appeared a very small job – the nut might have, after all, cost not even a dollar – but the negligence was enough to destroy many lives and the aircraft worth millions of dollars. 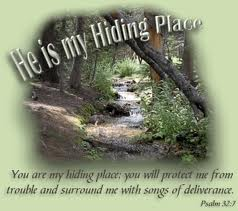 A song of Don Moen's "YOU'RE MY HIDING PLACE" represents us where we can hide ourselves and do all godly things that have designed for us even tiny, so that we may enter into the joy of our MASTER as a GOOD FAITHFUL SERVANT. LISTEN it!